Whether it’s sampling exotic and tasty cuisine, shopping, or just taking in the sights, Marrakesh offers many delights that are waiting to be discovered. Top on our guide of the best things to do in Marrakesh is a visit to Ali Ben Youssef Madrasa site. Marrakesh is a city alive with history, in its ancient architecture and numerous tombs scattered throughout the area, and the customs of its people that have changed little over the centuries. Of the many historical sites located in the city, one of the most popular is Ali Ben Youssef Madrasa. This school, which was in use until the 1960s, was founded in the 14th century by Sultan Abu al-Hassan. Its beautiful mosaics can still be seen throughout, along with intricate cedar and marble carvings that adorn its courtyard. 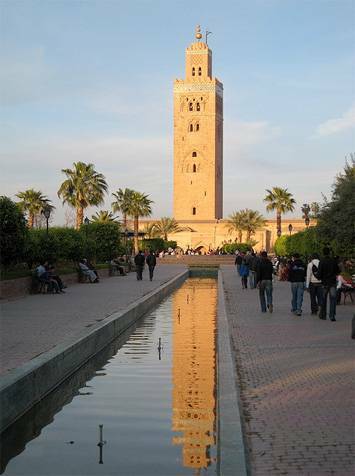 The Koutoubia Mosque and Minaret was constructed in the 12th century by Almohad Sultan Yacoub el-Mansour. The name, meaning librarian or bookseller, is derived from the many shops that once encircled the mosque selling scrolls. The minaret of this important local icon reaches almost 70 meters in height. Local legends claim that the three original globes that topped the tower were made of solid gold, although the globes that currently top the mosque are crafted from copper. Today, the mosque is surrounded by lovely gardens, thanks to recent renovations. 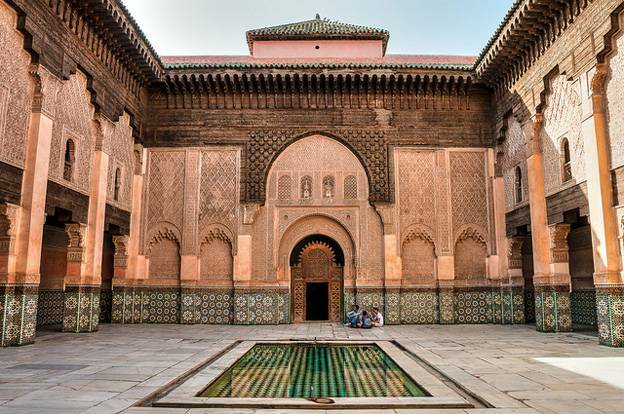 Situated in the heart of the Marrakesh Medina are the Saadian tombs. These tombs, created by Sultan Ahmed al-Mansour for his family, the ruling Saad dynasty in the latter part of the 16th century, were rediscovered in 1917. Beautifully preserved mosaics adorn the walls throughout the two mausoleums where the royal family is laid to rest. Outside is a lovely garden where the graves of household staff and honored military officers are situated beneath a grove of orange trees. A true must-see when visiting Marrakesh! A great way to see Marrakesh is in a caleche. These horse-drawn carriages are in abundance throughout the city, especially near the Medina gates and prominent shopping and dining areas. At the end of a busy day of exploring, a caleche ride offers a relaxing respite and lends a romantic ambiance to welcome the evening. 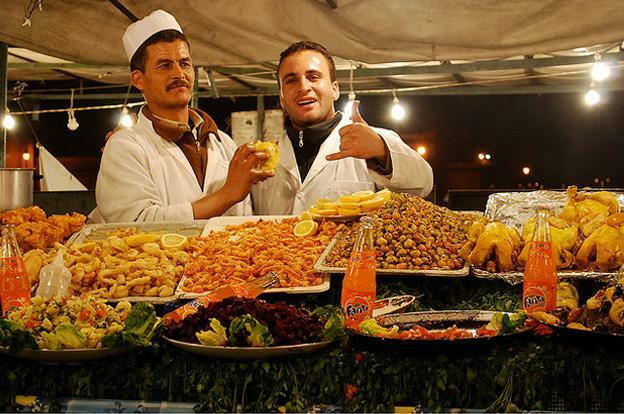 Fine dining is plentiful in Marrakesh, but to really get a taste of the traditional delicacies of the city, head to Djemma el Fna square in the Medina for an evening of delectable treats. Dozens of food stalls and cafes open their doors as the sun sets to serve up some of the best food found in the city. Lovely belly dancers will entertain you throughout the evening, lending to the festive atmosphere, as well as acrobats, bards and musicians performing throughout the square. The menu changes each evening, so dining becomes an adventure in true Moroccan style. Sample a delicious selection of grilled meats, flavorful vegetables, couscous or one of the many tasty local specialities. Top off your meal with one of the many delicious desserts and pastries, then sit back, enjoy a spiced tea and soak up the sights. 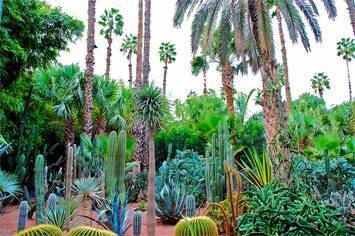 A tranquil oasis in the midst of the bustling city, Majorelle Garden is a favorite Marrakesh destination for locals and tourists alike. Designed by Jacques Majorelle, a French painter, it is deemed his finest masterpiece. Hundreds of exotic plants from around the globe accentuate lovely gazebos and winding walkways, stately marble pools and many exquisite water features. Nestled within the garden is the Islamic Art Museum, a cobalt blue building that once served as the private studio of Jacques Majorelle. Inside are many artefacts and fine works of art showcasing Islamic culture and history, including weapons, textiles, jewelry and more, and a collection of works from Jacques Majorelle. No trip to Marrakesh is complete without a day of shopping at the souks. Indulge in luxurious leather goods or browse beautiful finely crafted jewelry, sample local delicacies at the many food vendors throughout the marketplace, browse the fine hand crafted pottery and locally dyed and crafted fabrics, or even shop for exotic spices. The list of items for sale at the various vendors is nearly endless, with something for nearly everyone and all at great prices, if you are willing to haggle with the merchants. Although it is rather chaotic, it is an adventure that should not be missed. Rosa the author of the best things to do in Marrakesh, houses a virtual data center design from ProfitBricks to help her international blog!